A Bug's Life. The Bee Movie. Honey, I Shrunk the Kids... There's something fascinating about the world going on under beneath our feet and under our noses. Weird City Games have created a game all about the fascinating world of ants, and it's on Kickstarter right now. Is this game the bee's knees, or does it spoil the picnic? Let's find out! We should note that Weird City Games provided us with a prototype copy, so none of these images or descriptions should be considered final. Not too deep, but deep enough to still be interesting. Luck of the draw can play a factor. Passing mechanic doesn't really work. Family? Maybe! I could see my family playing this in a couple of years. Youth Group? No! I'm just not sure how much they'll care about the theme. Gamers? Yes! It's not terribly deep, but there's still interesting things going on here. Nongamers? Maybe! Especially if your nongamers like ants. A good area-control game with interesting gameplay, some conflict, and cool special powers. Each player takes a Nest mat and all of the cubes in his or her chosen color. Place the Great Tunnel in the middle of the table. Each player places five cubes of his color in his Larva Chamber, one cube in the Great Tunnel, and one on the start space of the score track. Shuffle the standard Meadow hexes and create a facedown pile. Randomly take two starting Meadow hexes for each player, shuffle them up, and place them facedown on the draw pile. Return unused starting Meadow tiles. Shuffle the Ant cards and deal two to each player. Player take Food tokens, based on the number of players in the game. Place the round marker on the appropriate hex, depending on the number of players. Finally, pick a starting player. The game is played over a series of rounds, and each round has three phases: The Worker Phase, the Soldier Phase, and the Queen Phase. The Worker Phase is where the majority of the gameplay takes place. Players take turns in clockwise order taking one action. This continues until two players Rest (or, pass), and the round is over. In a 2-player game, after one person Rests, the other gets on final action, and the phase is over. Much like Puerto Rico (and many other Euros now), if a player takes an action, the other players can take a secondary action off of that, if they so choose. These secondary actions have no cost, and are taken in clockwise order. Explore--You pay one Food, and draw and place one Meadow hex. It must be placed such that at least one of your ants can move into the hex with one step. Then you must move at least one ant from an adjacent hex onto the newly placed one. If the hex has a centipede symbol on it, you place a Centipede token. The secondary action here is that you can place one larva from your Larva Chamber on any Meadow hex you inhabit, or into the Great Tunnel. March of the Ants--You pay one Food, and you can move larva and ants up to five "steps." You must move larva before you move ants. When you move an larva to the Great Tunnel, or to a Meadow hex, it becomes an ant. The secondary action lets you move one ant one step. Each Meadow hex has Collection Sites on them, which give players various bonuses at the end of the round, such as new larva, food, cards, or VPs. One site per hex is considered the Defender Site, and conveys bonuses for fights. When an ant moves to a Meadow hex, it moves into a vacant Collection Site of the player's choosing. If there is more than one player in a hex, and there are more ants than there are Collection Site spaces, then there will be a fight during the Soldier Phase. Forage--You pay one food and you can draw two Ant cards. The secondary lets you gain one larva (into your Larva Chamber). Play a Card--Play and resolve one Ant card from your hand. The secondary lets each other player discard an Ant card to draw a new one. Unlike the other actions, this doesn't cost a Food, but each card does have a cost in Ants on it. You can pay this cost using any combination of Ants or Larva from anywhere on your board or other hexes. Events--One-time effects that affect the game in some way. For example, the "Cultural Theft" card makes each other player discard a card, and you can immediately play one of those cards (still paying costs for it). Colony Goal--These are cards that give players VPs at the end of every turn where a specific condition has been met. For example, "Epic Stores" reads that you gain 1 Food, and each Slumber you gain 1 VP if you have more Food than one neighbor, and 2 VP if you have more Food than both neighbors. Evolution--These are cards that basically give your ant special powers. I know!! Each Evolution card is either a head, thorax, or abdomen. Once you play it down, your ants can now do that awesome thing. For example, the "Tunneling Thorax" lets you move your ants between any adjacent Meadow hexes, regardless of tunnels. Or the "Honeypot Abdomen" lets you choose one Collection Site you control during Harvest and collect resources there twice. Each card spot on the ant body also grants you a bonus, as long as there's at least one card there. For each Head section card, you increase your Army Power by one during the Soldier Phase. The cost of Event Cards is reduced by one per Thorax evolution (but never below 0). And during the Queen Phase, each Food feeds an additional ant per Abdomen Evolution. Rest--The first time during a round that a player rests, that player gets one larva, and the starting player marker. That player is done for the round, though she can still perform secondary actions. If it should get around to the player who rested, that player gets a Food. This continues until a second player rests, when the round ends. Now there are battles in any hexes where there is more than one player, and more ants than there are Collection Sites. A hex with a Centipede is always contested. Battles are fairly straightforward. Each player counts the number of ants in the hex. Then each player can place a card facedown, and simultaneously reveal it. Each card has a "pow" number on it from 1-4. The number on the card counts toward the player's total. Highest total wins, and ties go to the defender. The winner removes enemy ants equal to the number of ants they have in the hex, and the loser destroys enemy ants equal to half the number of ants they have in the hex, rounded down. The winning player can't lose his or her last ant in a hex. The winner gains a VP. This is the cleanup phase. Each player collects resources from occupied Collection Sites. Then you have to feed ants (1 Food feeds four ants). If you can't feed everyone you lose one larva (and then one ant), for each unfed ant. Each player then gains either 2 Food or 5 larva--player's choice. 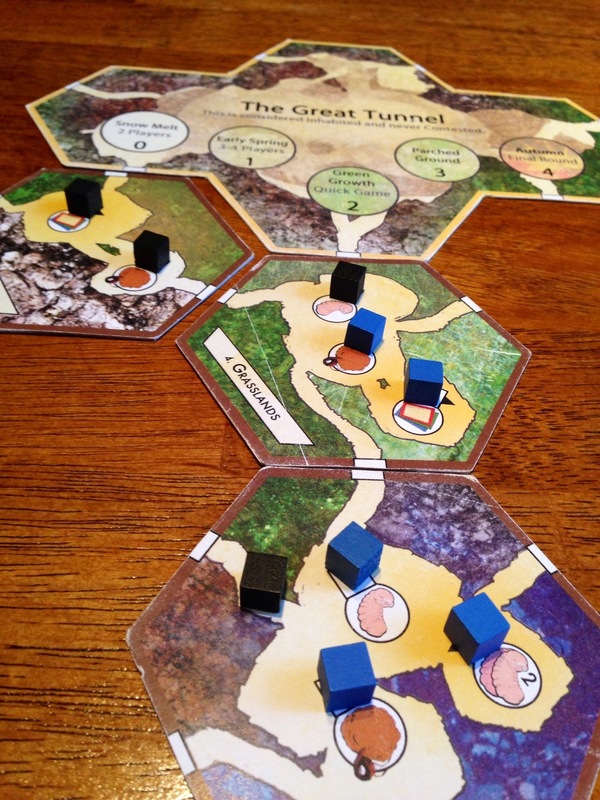 Finally, you Slumber, and gain 1 VP for each Meadow hex you control that is adjacent to the Great Tunnel. And VPs for meeting the condition of Colony Cards. Advance the turn marker and do it all again. 4 VPs for a complete ant body (one card in each of the three positions). 3 VPs for the player with the most larva. 3 VPs for the player with the most food. 3 VPs for the player with the most cards in hand. Ties go to the player with the most ants in the Meadow. I know this seems like a lot of stuff going on, but it's actually straightforward. And the gameplay isn't as "deep" as I thought it would be. I don't actually mean that in a bad way. I'm just saying I was expecting something like Dominant Species or Myrmes, but it's just lighter than that. The player cards are really good at helping you keep track of what's going on. They show you exactly what actions you can do, what the cost is, and what the secondary action is. Then they also break down the other Phases, too. And this is in addition to having a place for larva, Food, and Evolution cards. It's a really great design that conveys practically everything you need. The designers have said they wanted to try and create a game that played quickly, and could appeal to both casual gamers and gamer gamers. This game walks a very fine line with that. It might have too much going on for most casual gamers. And if gamer gamers go in expecting Tigris & Euphrates, they'll be disappointed. One guy in my group thinks he'll like it even more playing a second time and knowing what to expect for the heaviness. One thing I appreciate is that fighting isn't the only way to win, here. A well-placed tunnel, or cool combos of Evolution Cards are just as important as fighting over that great hex with the VP spot on it. There's conflict, but it's not ALL conflict, and I like that. My group did have a few small problems with the game, with the biggest one being the passing mechanism. In the last turn, I was going first and pretty sure I had the win. My instinct was to just immediately pass, and hope someone else passed, too, so others didn't get a bunch of time to gain some VPs. The person to my left thought he might pass, too. We didn't, but we realized that really could have hurt those other two players, who wouldn't have even had a chance to do anything for an entire turn--in a 4-turn game. We talked about some possible solutions, including making the round end only when one fewer people than the number of players have passed. What I really admire about Weird City Games is that they listened to our feedback (and the feedback of others on the same passing mechanic), and are thinking through what to do for the final release. This isn't about us being right. We might not be. But it says a lot that they're willing to listen to people who have a problem with their "baby" and think of ways to make it better. 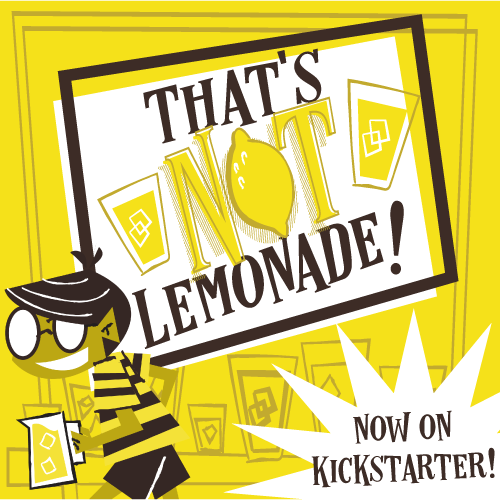 There's only one week left on the Kickstarter campaign, and they've doubled their funding goal, so all sorts of fun stuff has been unlocked. And the price on the game is a very reasonable $35, shipped. 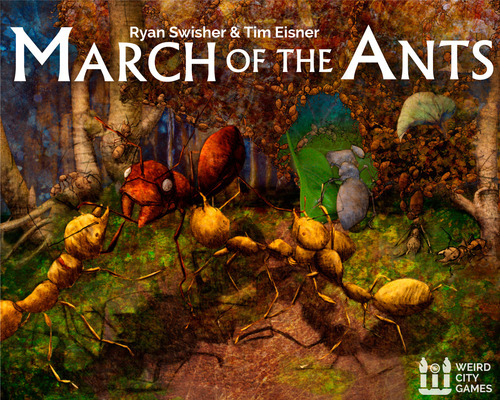 If you like science, area-control, special powers, and a game that you can bring out in mixed-skill-level situations, give March of the Ants a look.